For all this talk of iPads and Kindles and e-readers and digital textbooks, apparently college students aren't ready to give up their back-breaking tomes just yet. At least that's what yesterday's New York Times article indicates. Despite the fact that in most cases, print books are more expensive, college kids surveyed in two studies said they "prefer a bound book to a digital one." And I think that's the revelatory part of the quote: "grew up learning from print books." 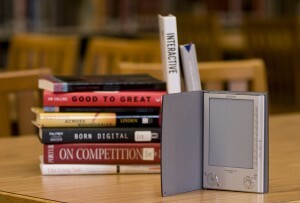 When today's college kids began reading, say around 1998 (assuming they're 18 years old now and were 6 when they started reading), there were no iPads or Kindles or Nooks. We only had books, brick-and-mortar bookstores, and libraries. Fast forward 12 years. Future college-bound children like mine (crossing fingers), are seeing their parents reading on Kindles and iPads and other e-readers. And not just a few of us here and there: The Wall Street Journal reports that "11 million Americans are expected to own at least one digital reading gadget" this year. Kids and parents are using the gadgets for games and watching YouTube, but also for reading. When you consider this in a timeline, the rise of digital textbooks in higher education seems inevitable. Colleges are enticing students with free iPads. New products are flooding the market regularly. University systems are piloting new programs with renting digital textbooks. And experts say the iPad and its ilk can be the game-changer in this realm. But as with adapting to any new technology, the learning curve can be steep, and the ease and comfort with which users navigate college texts is -- at this point -- found in bound books. Who can blame a college student for not wanting to surrender the comfort of flipping through pages, writing notes in the margin, highlighting text and easily finding it again? College texts are essential to succeeding in school, and college students might not want to fiddle around with the newest software. My point is this: We are in the midst of a monumental shift in the way we learn. By the time today's grade-schoolers start packing for college, the publishing market will have been turned on its ear. New gadgets will replace today's shiny toys and open-source texts will have evolved to something completely different. Who knows what that will be, but I think it's safe to say their comfort level with those changes will be higher than today's college students.